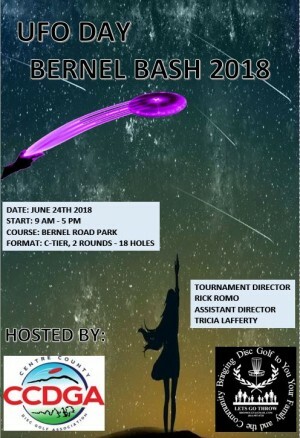 A PDGA Sanctioned event for both PDGA members and non-members. Non-PDGA members there is an additional $10 fee. For non-members, we recommend going to PDGA.com and join to start receiving the member benefits, now and for future events but mainly to help grow the Disc Golf Community. So if you are scrambling to gain points, this is the event for you before World AMs. 2 rounds of 18 hole disc golfing, using your discs to help celebrate World UFO Day and have a lot of fun DISC GOLFING!!!!! This is a trophy only event, including a small players pack. There will be an Ace Pool during the rounds (a playoff for all divisions if no Ace is made during the round). Lunch - Unfortunately will not be provided by Lets Go Throw or CCDGA under the guidelines of the Patton Township. Tournament Director is responsible for all refunds/cancelations.